Consistency is key! For maximum growth in this challenge, it is important to remember to apply NJoy's Long & Healthy Hair Growth Oil daily, or at minimum, every other day. Please note, even if the oil is applied every other day, the scalp should be massaged daily. Massaging the scalp on the days the oil is not applied reinvigorates the oil already deposited into the follicles on the previous day, so to speak. You may warm the oil, first, by placing the bottle into hot (but not boiling) water and allowing it to sit for a few minutes. This is completely optional and not necessary for good results but helpful in jump starting increased blood circulation to the scalp. Shake the bottle well before using the nozzle to apply directly to your scalp. -- a little goes a long way -- Then massage the oil across your scalp by applying firm enough pressure and using the pads of your fingers (a nd not your nails). Massage for about 4-5 minutes whether you're applying the oil daily or every other day. Bending forward while massaging not only helps to increase blood circulation to the scalp but may make it easier to access the scalp while your hair hangs away from your scalp. This, however, is not necessary to receive results but may improve your results. After massaging the Growth Oil to cover your scalp and stimulate increased circulation, you may feel a warm or tingling sensation. This is increased blood flow to the scalp and hair follicles. You may or may not experience this feeling with every application and the feeling may subside a short while after the initial sensation. These are not problems and are quite common. Be assured that any of these experiences is okay. For better penetration of the Hair Growth Oil, cover your entire head with a plastic cap after massaging the oil across the scalp. If you are leaving the treatment on your scalp overnight, it is suggested that you cover the plastic cap with a hair scarf so that the caps's crunching sound doesn't keep you up. The body heat released from your scalp will cause the pores to open for greater penetration and will also cause a moist environment, known online as the Greenhouse Effect, that will add moisture to the entire length of your hair. This step is not required. If you are wearing straight styles and are not interested in adding moisture to the length of your hair, then skip this step. NJoy's Long & Healthy Hair Growth Pomade may be a better option for you. It absorbs into the scalp without leaving an oily residue that may weigh down straight styles. The treatment should be left on for at least 30 minutes but does not have to be washed out. Your scalp will absorb the Hair Growth Oil. I recommend applying the Hair Growth Oil as an overnight treatment. And in the morning, groom as usual, whether that includes a wash or not. Removing a plastic cap worn overnight will leave the hair damp and the scent of the product may initially seem more pronounced. Just know that both will dissipate shortly once the cap is removed. Personally, when I was relaxed, I washed the oil out each morning. 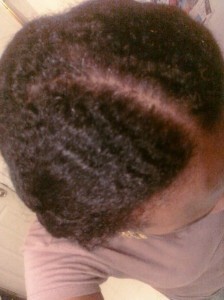 But as a natural, it was more convenient for me to allow it to remain until my weekly wash day. Although the oil resists build up on the scalp, remember to continue massaging the scalp daily. Not only does this increase blood flow but dislodges any environmental debris that may try to accumulate on the scalp. NJoy's Long & Healthy Hair Growth Oil is the basis of ensuring growth in this Challenge. This formula is a blend of natural ingredients known to stimulate and support faster hair growth. We'll talk more about how and why it works int the next update. Remember, consistency is key and accountability drives consistency. Head over to our Facebook Group and let us know how often are you applying NJoy's Long & Healthy Hair Growth Oil?